PathStone asked us to create a special book to celebrate the completion of the renovation of Andrews Terrace. The book features personal stories and photographs of the residents, along with before-and-after photographs of the building. Photographs by Walter Colley. Delicious Developments, created for the Friends of Strong Memorial Hospital, took on the theme of one of Rochester's claims to fame: Photography. Images from some of our region's most talented photographers, as well as others from the collection of the George Eastman House, form the framework for original recipes from the community. 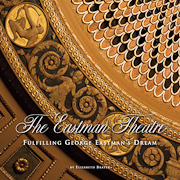 Published by the Rochester Philharmonic Orchestra, this 208-page hardcover book celebrates the history and renovation of the theater. Authored by noted historical writer Elizabeth Brayer, it is richly illustrated with period imagery as well as breathtaking new photographs by award-winning photographer Andy Olenick. All proceeds will benefit the Rochester Philharmonic Orchestra.